It took some time for Lusine Poghosian’s male classmates to adapt to studying alongside her and several other young women at Armenia’s main military academy. They were the first-ever group of female cadets admitted to the Vazgen Sarkisian Military University two and a half years ago. “In the beginning, it was very hard for the boys to take us seriously. Now they can’t imagine their service without us,” Poghosian says with a grin. The 20-year-old future artillery officer, clad in camouflage fatigues, exemplifies a growing number and role of women in Armenia’s armed forces, a trend that the recently reshuffled government in Yerevan wants to accelerate. Government officials say the effort is aimed at promoting gender equality, and making more efficient use of the human resources in the small South Caucasus state. In its wide-ranging policy program approved by the Armenian parliament in October, the government pledged to “expand opportunities” for women who serve in the military, or want to join. As newly appointed Defense Minister Vigen Sargsian told lawmakers, it will facilitate their military education and promotion, and strive to ensure their “equal rights” with men. According to Armenian Defense Ministry officials, the military currently employs more than 2,000 women, compared with roughly 1,400 in 2012. The Armenian army is thought to have between 40,000-60,000 soldiers. The vast majority of women holds clerical positions or serves in medical services and communication units. But there seem to be more and more women in combat roles too, notably snipers and sappers. Defense officials decline to discuss specific numbers. Some female soldiers have been allowed to speak to Armenian media outlets in recent years. “The more girls serve in the army, the more disciplined it gets,” one female sniper wearing a dark green balaclava told the A1+ TV station in 2013. The Armenian army’s chief parachute jump instructor, Capt. Kristina Ilikchian, is a woman. A recent special report by Armenian Public Television showed her and another female officer training mainly male paratroopers. “There have been many cases of guys approaching me right after descending in parachutes and saying [jokingly], ‘Had you not been a woman, I would have never jumped,’” Ilikchian told the state-run broadcaster. Women’s recruitment was encouraged by Seyran Ohanian, the former defense minister replaced by Sargsian in October. “Women’s involvement in the army is growing every year,” Ohanian said during an August 2016 visit to a pro-government youth camp. The Marshal Khanperiants Aviation Institute, which trains military pilots and air-defense officers, was the first academy to admit five young women in 2013. More than 30 female cadets are currently enrolled in this and the other academy in Yerevan. Perhaps counter-intuitively, many female cadets come from rural areas where patriarchal attitudes towards women are particularly entrenched. The 19-year-old rejects the notion that women are unfit for combat duty. “When it comes to military service, everyone speaks of physical burden and difficulties, but mental preparedness is much more important here,” she says. Quite a few women from Armenia and Nagorno-Karabakh participated in the 1991-1994 war with Azerbaijan. At least 18 of them were killed in action, and 115 others had the official status of war veterans as of 2012. It is not clear to what extent women are directly involved in ongoing Armenian military operations along “the line of contact” around Karabakh, and along Armenia’s long border with Azerbaijan. Armenia’s defense ministry claimed in January 2015 that a female Armenian soldier had killed an Azerbaijani sniper on the line of contact. 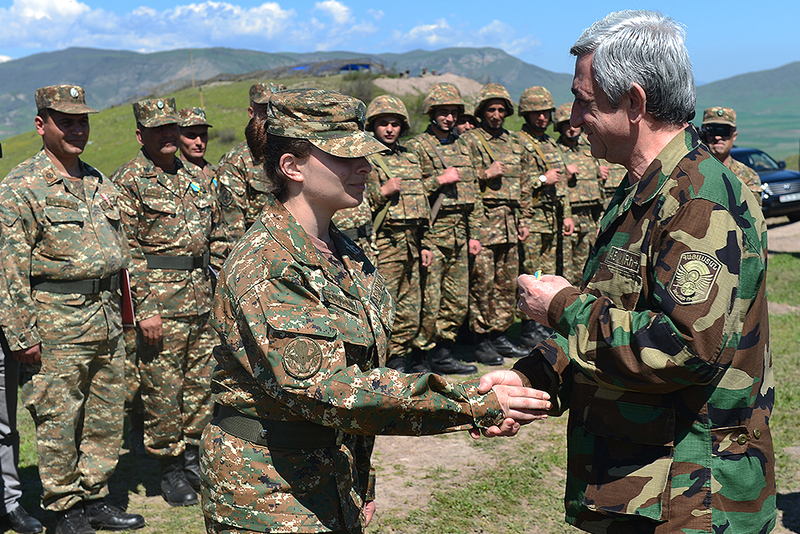 Defense Minister Sargsian made clear that the Armenian military’s efforts to attract more women do not mean that frontline troops will heavily rely on them anytime soon. At the same time, he vowed to put in place “equal promotion opportunities” for female personnel. The existing Defense Ministry regulations place strict limits on the military ranks and positions of female officers serving in non-medical units. They are likely to be revised soon, according to Alik Avetisian, head of the ministry’s Center for Human Rights and Integrity Building. Ohanian already approved in February 2016 a ministry “roadmap” that calls for “expanding the circle of positions to be held by women” and “increasing their participation in decision making.” Neighboring Georgia also has been trying to increase the role of women in its military, and while women’s combat roles there are limited, some have been deployed to Afghanistan where they patrol alongside men. Azerbaijan’s Defense Ministry has said that about 1,000 women serve in the country’s armed forces, but none in a combat role. Neither the Armenian government nor society as a whole is yet prepared for a more radical solution favored by some public figures and inspired by the example of Israel: making military service compulsory for women as well as for men. Tevan Poghosian, an opposition parliamentarian and a father of four young daughters, has repeatedly made a case for drafting women. Poghosian, 44, welcomed the government plans to increase the number of women in uniform, saying that this is good not only for national security, but also broader women’s rights in the country. “Hopefully, gender equality will step-by-step take hold in the military,” he said. Emil Danielyan is a Yerevan-based journalist.